Serendipity brought this wall hanging to life. 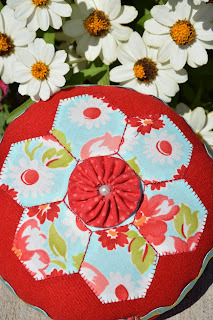 I had been working on hexies with no particular project in mind when I heard about the blog hop. I signed up and started to think about what to do. So, I grabbed a piece of white fabric, ric rac, made some yo-yos... I embroidered in between the hexies to emphasize the 'petals', added a scrappy border and quilted away, doodling all over the quilt. 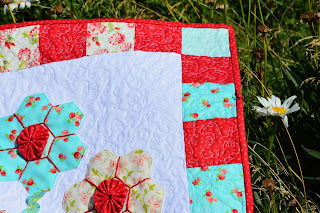 ... by using blanket stitch to machine applique another hexie flower onto beautiful red wool, added a pearl to the middle of the yo-yo, and surrounded the whole thing with more ric-rac. ... handstitched the hardware on. This is the back side. The purse is lined with the same red fabric featured on the wall hanging. It has been fun being a Hexie Queen for a day! I already know who will get these three matching projects this coming Christmas, and I hope she likes them! 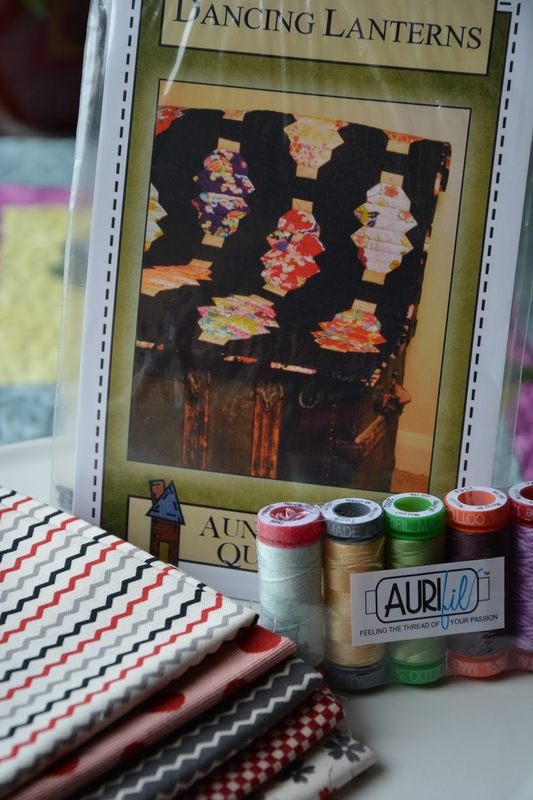 One lucky winner will receive a fat quarter bundle, a pattern, and - courtesy of Aurifil - a sample pack of threads! 2. Bonus: leave me another comment telling me you are a follower, for an extra entry! This giveaway will close tomorrow, August 28, at 5 pm. The randomly chosen winner will be announced on Thursday, August 29, here at this blog. I will ship internationally, too! 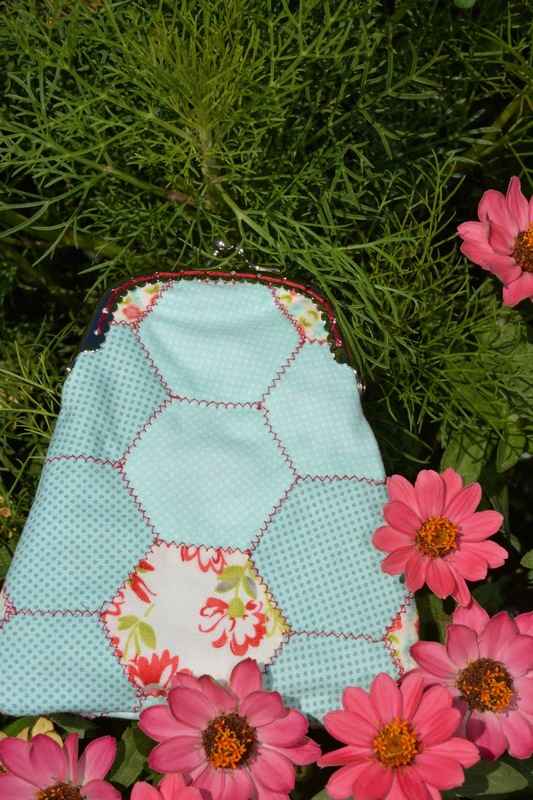 The hexie coin purse is my favourite, it's so cute. I've not really made a hexie project yet, not had the patience. But all the things you can make with them are so nice! I'm one of your happy followers by the way :) Thanks for the chance to win! I love all your projects. Am I on your Christmas list? Yes, I am a happy follower. I love all your projects - my favourite colours!! love your wall hanging, pin cushion and coin purse. lovely work. thanks for the giveaway also. Love the aqua and red combo- your workmanship is pure artistry! Gorgeous projects and the colors are perfect. Oh thanks for the chance - I love hexies! Love all your creations - lovely each one!! And thanks for such a generous giveaway - wow! Crossing my fingers!! I follow your blog via Bloglovin' - thanks for an extra chance to win!! I'm an "hexieolic", your projects are awesome, love the giant pincushion. what gorgeous Hexi projects...you really are a "Hexi Queen"! thanks for a chance to win your fabulous giveaway. I'm already a follower. Thanks for the lovely giveaway. You have such a great assortment of hexie projects. Cute yo-yo centers. Love all your hexies projects.The coins caught my eye! I do follow.Thanks for the giveaway!! Hello from Minnesota. Great finishes! I just made a little hexagon trivet and now I'm so ready for more six-sided goodness! Great projects! Love your fabric choice. Thanks for sharing! This is my very favorite color way, sew I LOVE your projects. Also admiring your bravery to start and then be creative as you went along, using all the fabric very successfully. Beautiful!! Love your projects, especially the hexie flowers, I have loads made up, keep kidding myself I am going to make a quilt with them.... maybe one day. Thanks for the giveaway. Gorgeous Hexie Projects!! Thanks for sharing...and thanks for the chance to win your wonderful and generous give away!! I've never tried hexies. Love the cute coin purse. Beautiful ! I'm so glad you shared your wonderful creativity Denise ! I am a happy follower and would love to win that fun giveaway package! What precious flowers Denise and so many cute projects! Love the coin purse! So if you click on my name in comments list do you get to my gmail address? Just in case here is my yahoo addy: yessewingisfun at yahoo dot com. Thanks for joining the hop. the recipient of your projects is one lucky lady! Cute projects! I haven't gotten into hexies yet, but this hop has me interested. Such beautiful projects...love the colours you used and the creative ideas that you came up with. The flowers are my fave! And what a generous giveaway! 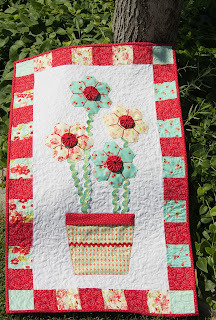 I love the bright fabric in your projects so cute! Great giveaway also thanks. Love the pincushion! I am working on a hexie table runner. They kind of ask to be flowers don't they? What cute projects. Love the wallhanging. What a sweet wall hanging. I love the way you put the colours together. I love your wall hanging and quilted it! Love matching projects, what a great treat for your friend. Yippi, I'm your follower too, Blogloving. Thank you for sharing your very beautiful ideas. I am loving this blog hop. ohhhh I love the wallhanging, would it be ok if I stole the idea ??? it's fab and I'm like you got some hexi's hanging around and always have a yo yo in the making, the ric rac is genius. I have to say that the pincushion is my favorite although they are all cute. I love your flowers. They look absolutely gorgeous. You pin cushion is adorable. Who has enough pin cushion anyway? I might try that one myself. The coin purse is darling too. Well done you! I really like the giant pincushion, but am also amazed with the rickrack stems you made, that is ingenious. Thank you for sharing your ideas! Love the colors on your hexie flowers! You've got a great eye. All your Hexie projects are simply gorgeous! Love them all!! love the flower wall hanging and the pincushion..
Those little purses are the cutest. Looks like someone has been having too much fun with hexies. Love it! Your hexie projects are all so pretty in my favourite combo of red and aqua! Wonderful to find your lovely blog. Your hexie projects are adorable. A lovely trio of makes! Following via email. Thanks for the chance to enter. I love them all. The wall hanging is my most fave of the 3 you created. Love the fabrics you used. It is absolutely stunning. 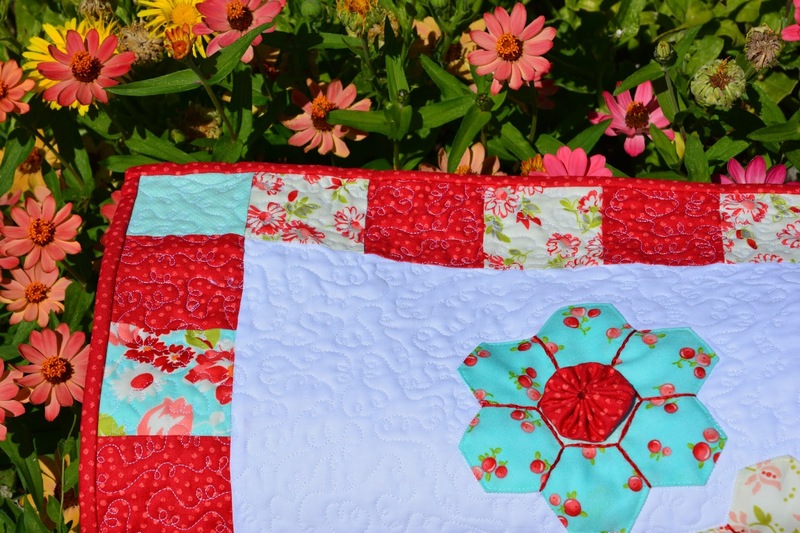 The quilt with the hexagon flowers is so cute! However, I think the purse is my favorite. I love functional projects. Thanks Denise for the giveaway. Great projects! Esp love the rick rack stems:) Too cute!!!!! 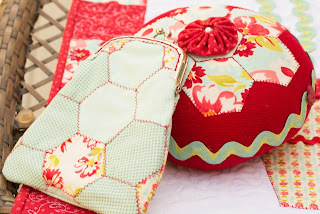 Love your hexie project, I'm a big fan of red so this is really pretty to me! What a great giveaway to! How wonderful! Thanks for the chance! I love the flowers!! Your projects are so cute and will make great gifts. I love the long coin purse and the fabric you used. I have a soft spot for pincushions and love yours. Thanks for sharing and what an amazing giveaway! Adorable projects. Lucky gal to receive all of that...the long coin purse is darling. Thanks for sharing with us. I love your trio. Yo yo's and hexies go so well together. I hadn't thought of that. What a lovely Christmas gift. I'm a new follower and quilter and I'm really loving your blog. Very cute projects. I love those purses with those clasp closures. I also have finally realized using ricrac for stems is easier and cuter than making my own! Thanks for sharing. Oh, very clever! Three projects - I think that makes you a hexi queen! One of these days, I will need to try my hand at a pin cushion. Yours sure is cute! Thanks for sharing. I love your pincushion....so neat. What a cute idea to put a yo-yo in the middle and embroider the petals. Love it! Very cute projects. Hexies just make fabric come to life. I like all your projects, especially the little hexie purse. Love your hexie projects. Thanks for a chance to win your fab prizes! Cute projects. Thanks for the chance to win. I like you circle flower quilt on the top of your page. The colors, the blanket stitch, rick-rack, and yo-yos really take these projects over the top with cuteness! Denise! I have been waiting all week for your post and you certainly did not disappoint (because you never do)!!!!! Love love your projects and since I started following the hop last week I have totally been HEXED!!!!! Thanks for sharing your wonderful talent with us. All the little details that you do sure make your projects awesome. Just like the creator of them. My second comment is that you know I totally follow you. You are my inspiration. I will be posting about my hexation on my blog soon! Yay I am a follower through GFC. A great stop on the hexie hop!!! These are cute projects, I really like the pincushion and the pouch. Zigzagging the hexies is a great idea! I love all of your projects, but especially the red hexi bowl. Very pretty! I just started a small hexi project of my own. I am loving it. I am inspired by your cute projects. Really cute projects. I love your flowers and flower pot. 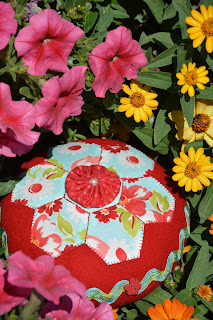 I made a tumbling flower pot out of the Quilter's Newsletter this summer--well, I have made several of those--and thought the hexies would make a great flower for that pattern. I can tell by yours that I was right. Also, I love the pincushion--you can never have too many--and the coin purse! Thanks for having a give-away! I love your little coin purse! Thanks so much for your giveaway! I follow via RSS. Thanks! Thanks for the giveaway! I love your wall hanging. Those colors are gorgeous! Your wall hanging is so cute! Thanks for sharing! Very cute pincushion! Working on a hexie project myself. Will have to keep this in mind for the leftovers. Thanks for the giveaway! I enjoyed your projects. That is a wonderful pin cushion! Love all your hexy projects, Denise. Beautiful color palette, hard to choose a favorite. Thank you for sharing. I love your wall hanging, it just makes me feel happy! Thanks for the giveaway. Amazing hexies! Like the colors. I love all of your projects they are all very cute and the fabrics are fabulous. I will just have to learn how to make hexies. ooooh I love these hexie projects. They look like so much fun to make. I'm a new follower! Great blog. Lovely projects you've completed. Love your flowers. Thanks for the opportunity to win your generous giveaway. I follow you via email. Thanks for the opportunity to win your giveaway. Denise, your projects are so gorgeous! I really like the flowers with the addition of the yo-yo's. Haven't thought of this. Someone will be very happy at Christmas! Thanks for the giveaway. I love your wall hanging. So cute. Thank you for sharing. I love the flowers.. You are so creative. I signed up to follow you by e-mail. Just so lovely! To take that hexie and place it on top of a pincushion is so sweet. And the extra details of the yoyo and an extra little pearl. Love your colors and attention to detail. Thanks so much for all the beautiful pictures. I enjoyed seeing what you did! 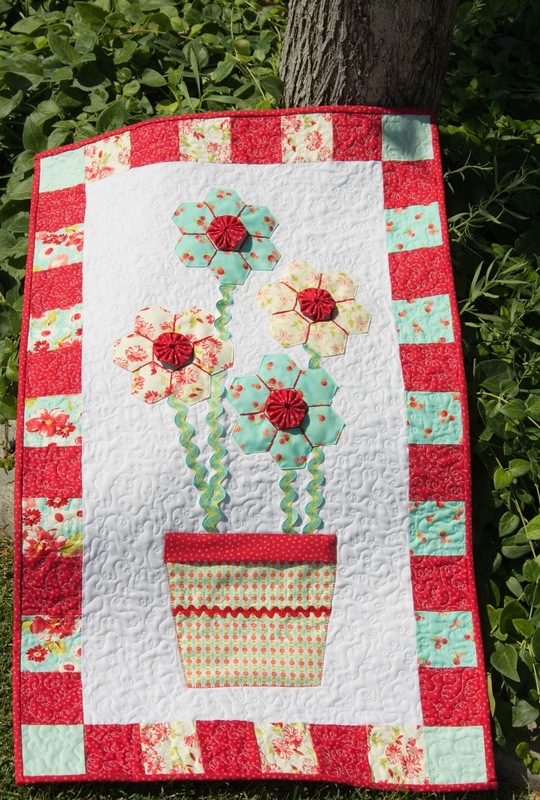 Your hexie projects are darling - love the wall quilt. 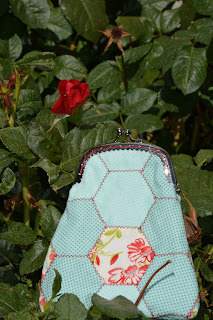 I'm not a real hexie fan but sure have enjoyed following the blog hop. Thanks for sharing. I am a happy follower & love seeing what you are up to - always something different! Your projects are amazing. I love your attention to detail, especially the pearl in the middle of the yo yo in the hexie - what a great touch. All of your projects are absolutely gorgeous. I love the hexie flower wall hanging. It is bright and cheery without being gaudy. It is just so homey and inviting. Great job. Your hexie coin purse is marvelous. What a great idea! And the oversized pin cushion is wonderful. I don't think you can have a pin cushion that is too big except for manageability. I have so many pins that I don't know what to do with them all. My friend is always finding them all over my house. And I adore the pearl as I said. I saw where you are turning your 12 year old niece into a seamstress. How wonderful AND the perfect age. It's great to see young girls wanting to learn to sew. My daughter never took an interest. As long as Mom knew - that's all that mattered and still is the case. Now she's busy teaching school and raising two young boys and still has no interest. She has asked me to make her a t-shirt quilt. UGH! But you know Mom will do it. Thanks for participating and sharing and being generous with your giveaway. I enjoyed reading more than just today's post. Such beautiful projects. You really have "hexie fever" ! Very nice. Thanks for sharing and for the wonderful giveaway. Your hexie project is not only unique but adorable. Those flowers are coolio! So pretty and love the way you emphasised the petals and used yo -yos. Very beautiful! You used many of my favorite colors. Really cute projects! Your flowers are so sweet looking. I forgot to say that I am a follower on Bloglovin. Beautiful projects and creative ways to use hexies.